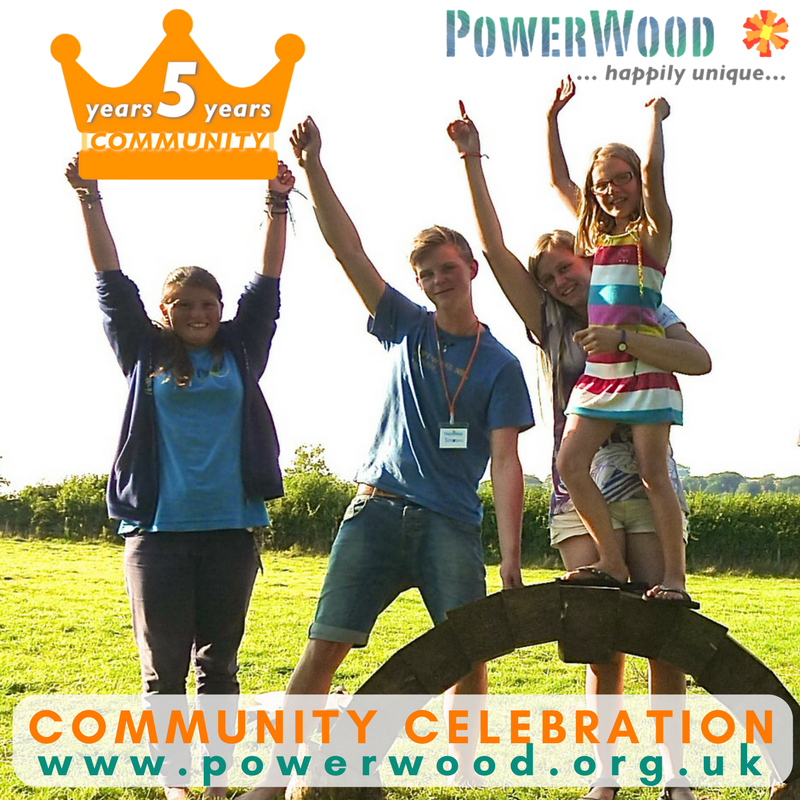 2018 is PowerWood’s 5th anniversary year as a non-profit Community Interest Company (CIC). We are taking this opportunity to celebrate what we have achieved, reflect on the needs of our community, create our vision for the next five years, and plan how we are going to achieve it! In 2017 we have supported record numbers of individuals and families through our FaceBook group, real-life events (camps and workshops), consultancy and coaching sessions and our newsletter and by distributing information about Neurodiversity as a force for change in society. We want to ensure we are in a position to support even more of you in the next five years and beyond! In 2018 we will be focussing our time reflecting on how to best serve our PowerWood community and increasing the benefits of PowerWood’s services and products for all of our community. This year we are prioritising taking time to hear your voice and develop our vision based on your input, and are working on a number of exciting projects eg. a new improved website and Simone de Hoogh’s long-awaited book! We have recently completed a full review of our PowerWood Camp and it has become clear that whilst the Camp has been a valued event for those able to attend, it is not an effective way to support larger numbers of families (as had originally been envisioned). We have taken the difficult decision not to continue the Camp in its current form but instead find other, better ways to provide this support. If the Camp was important to you then we are very sorry to disappoint you; please read on to ‘Let your voice be strong’ and tell us what aspects of the Camp you most valued so that we can find a way to provide those elements in a sustainable format. We want to respond to feedback we’ve received that has made clear that we haven’t been meeting the needs of our whole community. What better way to celebrate our fifth year than to take the time to really listen to each other and get clear what information and support we all want from PowerWood and how we want that delivered? We feel it is crucial to offer support that will meet the needs of the whole range of our community. Who are we? Do we have children, or not? Are we in a relationship, or not? What age are we? Where do we live? Which OEs do we have? Where do we feel we need support? We always seem to fight, why can’t I enjoy my children? He is so argumentative, both my partner and I feel out of sorts. How can I react better to rude behaviour in my teen? My child is inappropriately aggressive, how can I support him? I never want to slap my child again, how can I manage that? I feel bullied by my child, I know that isn’t right, how can I change that? How can I improve the communication with my child/partner so we avoid conflict? I need to learn to see the positives in my child’s behaviour. I want to understand my child, that might help me feel more compassionate. I feel so exhausted, what am I doing wrong? I feel so depressed, I don’t think my life will ever be better. I have been hiding in the attic for so long, can I ever start living again? I feel so overwhelmed by my responsibilities as a parent. I don’t really know what I want, I feel I don’t know myself. I’m scared of what will happen if I say what I really think/feel. I’ve been told I’m ‘too much, too emotional, too intense’ my whole life – how can I be true to myself and still maintain my relationships? I feel I have been holding back, how do I change that? Why do I react so much more strongly than others, what is wrong with me? My daughter avoids talking to or having eye contact with new people. What should I do about my child biting their nails until they bleed? My child has been diagnosed [e.g. ASD, OCD, Dyslexia, Dyscalculia, Dyspraxia, Dysgraphia, SPD, ADHD, ODD, PDA] and I wonder how I can support him/her? I really worry about my daughter, she is touching everything twice. My son struggles to fall asleep and has nightmares. It started with fear for dogs and now my child refuses to go outside, what do I do? My 18 year old refuses to leave the house. How do we want to be supported? What kind of support would we like? A regular podcast? An audiobook? An online course (what subjects do we want to be tackled)? A residential theme-based course? Respite weekends or weeks for families? Social residential weekends for young people – what age range should it be for? etc etc. Do previous/current clients want online groups where specific issues present in their family are being discussed? Or to be part of personal growth support groups? This is our chance to share! All your ideas and responses will inform us how to use our time to support the greatest number of people. We look forward to connecting and sharing our experiences and finding out what needs we have in our community. Thank you for sharing that our current site wasn’t fulfilling expectations. We are delighted to announce that as part of our celebrations, PowerWood will be launching a completely revised and updated website! We are working with IT professionals, who are kindly donating their time, energy and expertise so that we can have a much faster and more efficient website. We plan to have the new website going live in the Summer, so watch this space! Simone de Hoogh is in great demand as a very successful and experienced educational specialist and family coach. But her time is naturally limited. The solution? A book! What better way to enable many more families to benefit from her life-changing expertise in helping intense, sensitive and hyper-reactive (more) able children and adults to regulate their emotions. The book will pull together the concepts that are key to PowerWood’s success in helping support families and individuals with neurodiversity to live full and enjoyable lives. Simone is already working on the book and we hope to have news on a publication date towards the end of the year. Many of us have expressed an interest in having bite-size chunks of information to help to support ourselves and our family to regulate all the emotions that come along with the energy associated with OEs. Simone will be starting blogging regularly on a range of issues that are commonly experienced among our members – based on your feedback! We appreciated your time and energy to have shared with us your ideas and feedback. Our current website and offerings are based on your feedback.